Chechnya has lost so many men to war that survivors should be legally allowed to take several wives, acting Prime Minister Ramzan Kadyrov has said. Speaking on Russian radio, the pro-Moscow leader said this was "necessary for Chechnya because we have war - we have more women than men". He was backed by Russian parliamentary deputy speaker Vladimir Zhirinovsky. Russian law restricts citizens to one marriage, but Islamic custom allows a man to take up to four wives. 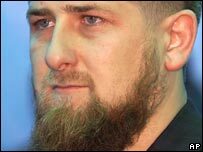 Mr Kadyrov told Ekho Moskvy radio that women in the Russian republic outnumbered men by 10%, and that a man should be able to choose how many wives he had without the state getting involved. "Every man decides for himself how he should live. He is the boss, he decides, I am sure that his personal life will not be interfered with," he said. Mr Zhirinovsky, who is the leader of the ultra-nationalist Liberal Democratic Party (LDPR), said polygamy should be applied across Russia "because we have 10 million unmarried women". He told the state-owned Itar-Tass news agency that he would introduce an amendment in the spring parliamentary session.